Recently I was invited to the Lighthouse, Poole to watch The Diary Of A Hounslow Girl. I don't normally get the chance to see something that isn't family friendly or kid's based so I couldn't wait to take my mum to see a show that was pretty close to our hearts. My mum lived right next to Hounslow and I knew that there would definitely be aspects I could relate to. 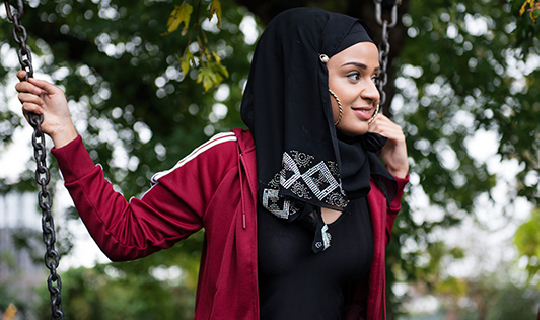 The Diary Of A Hounslow Girl is a one woman show written and performed by Ambreen Razia. It tells the story of a 16 year old Muslim girl growing up in west London and trying to balance her families traditions with growing up in a non traditional city. It covers everything from fights to weddings to love and dreams. I honestly didn't know what to expect from the play, but in the space of the show I was laughing until my sides hurt and crying with such emotion because I knew exactly how the character was feeling. I've never seen such a whirlwind of a play, a play that just made me sit back and think "oh my god, that was amazing". It's hard to explain just how powerful this play is without spoiling the plot. But it covers so many coming of age issues, that it reminds you behind every hardened teenage front is a human filled with way more emotions than you can comprehend. I left feeling as though I understood exactly how she felt, that all my teenage emotions were played out on stage. The Diary Of A Hounslow Girl is a play that I've been talking about since I left the theatre. It's one that shook me and hit me hard in all the right ways. It's one that will stay with me for a long time. If you're going to see any play this year, make it this one.